Opener “Wrecking Ball” might not be heavy metal but it is a heavier track for Robin – and she performs with conviction. There is a slight vocal effect and a fine refrain, and it comes across as very convincing. I can get the feeling of having heard it all before but there is always something special about Robin´s voice. The riffs are a tad less sparkling at times but as a whole the backing ensemble is flawless, as can be expected. There are a few flatter moments, the almost stubbornly boring refrain of “Sprain”, the boring riff and less rocking approach of “Catfight” and the simply less inspired ending of “Follow You”. But the magic is also there, especially in the expertly arranged title track and “Burning Me Down”, which would have been another “First Time” - had this been the eighties. 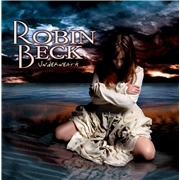 This is a more than fair album from Robin, not her best but easily one of her finest moments.